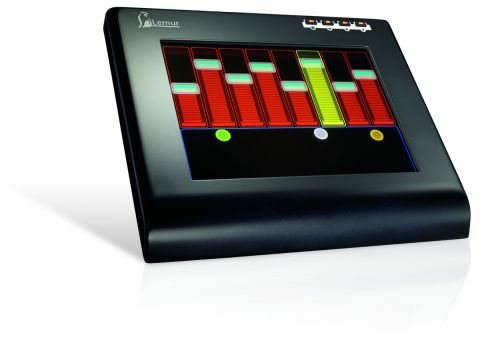 Yes, it´s pricey, but the Lemur is a futuristic controller that´s available today. Very impressive. Unique design and complex functions. Multi-touch surface. Build your own control screens. The Lemur might just be the most exciting new product to be released for years. When it´s up and running, it looks like something out of Minority Report, and it´s insanely addictive. The Lemur is a touchscreen controller that´s configured via Ethernet using JazzMutant´s Jazz Editor application, and this Ethernet connection is the only link between the Lemur and your computer. A selection of different controller objects of varying familiarity can be created, positioned and re-sized with the mouse. The most basic objects are buttons, pads and faders - the spooky ones are the Multi-Ball areas, where little circles of light that output X/Y values gather at your finger tips. The dynamic controllers can have physical modelling applied to them, so faders can be springy, and the little balls will move naturally around their areas, bouncing off the sides like billiard balls. The Jazz Editor application displays its own version of the Lemur screen, and all your actions are mirrored on the hardware. Once a controller object is on the Lemur screen, it will immediately respond to your touch and is ready to have its function, name and values applied to it. Each screen of controllers or objects is called an interface, and you can have several interfaces in one project (this can contain up to 1024 objects). Projects are saved as XML files. When a project is loaded into the Lemur from the Jazz Editor (or eventually from within the Lemur´s own onboard memory), its different interfaces can be displayed as thumbnails (and selected by touch), or scrolled through using the small rectangular buttons on the hardware. The controllers are given their functions by linking object values, expressions (preset mathematical functions) and variables (parameters in the software you want to control). This system sounds a bit daunting - and some of the maths involved is frightening - but with a little perseverance everything soon clicks into place and you begin pondering the possibilities. Opening the Jazz Editor reveals a browser, a properties window and a big Lemur logo. You link to the Lemur using the connect button in the top right - a window containing IP addresses and port numbers appears to ensure proper communication. Once connected, you click on the Interface icon and the screen goes blank. Then you´re ready to start building a new interface. Clicking Object presents you with a menu of those that are currently available. You then choose one - a fader, for example. This will pop up on the Lemur screen and the Jazz Editor, where its name, X and Y position and size, value and colour will be displayed in the properties window. Once you´ve placed it where you want it on the screen you can name it - let´s say you´re creating a master fader for Reaktor and calling it Master, for example - and the fader object is also listed in the project browser. As far as the Lemur is concerned, all its controller objects output a basic value of ‘x´, so our new fader would have a value of Master.x. OSC-compatible synths come with a list of their OSC controllable parameters (the OSC label for controlling the master volume could be Reaktor.MasterVolume). To make our new fader work we´d need to create what´s known in Lemur speak as an Expression. Clicking on the Expression button brings up the Edit Expression window. The OSC parameter is entered on the top line (ie, Reaktor.MasterVolume), and the value you wish to associate with it is entered below (ie, Master.x). A new Expression is then listed in the project browser: Reaktor.MasterVolume = Master.x. The new fader should control the master output of Reaktor. You can go deeper, but don´t be put off by all this mathematical mumbo jumbo. It doesn´t take long to get into the swing of creating your own interfaces, and it becomes as addictive as Sudoku before long! The Lemur will eventually come with tweakable presets; as it stands, making an interface is akin to programming a synth patch from scratch every time you want to hear a new sound. Happily, the current version of the Jazz Editor now has MIDI Expressions included, which effectively means that the Lemur transmits MIDI. The Lemur would show up as a MIDI node in any sequencer or synth application, making it instantly useable with just about everything. The response of the Lemur is instantaneous, even if the graphics themselves can lag behind a little. Certain little things could be improved: it would be good if the faders had an area of play at either end to help you set the minimum and maximum positions without missing the fader by a millimetre or two, and as yet, the meter won´t display values from the target synth. In general though, the Lemur is a joy to use and, ultimately, you´re only limited by your imagination.